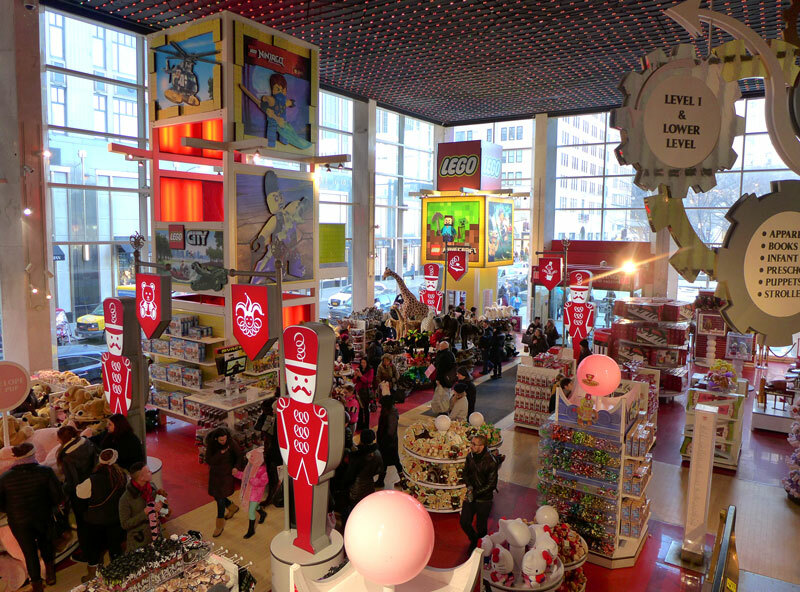 The scene from ‘Big’ unfolds in New York’s top toy store, FAO Schwarz, just south of Central Park. 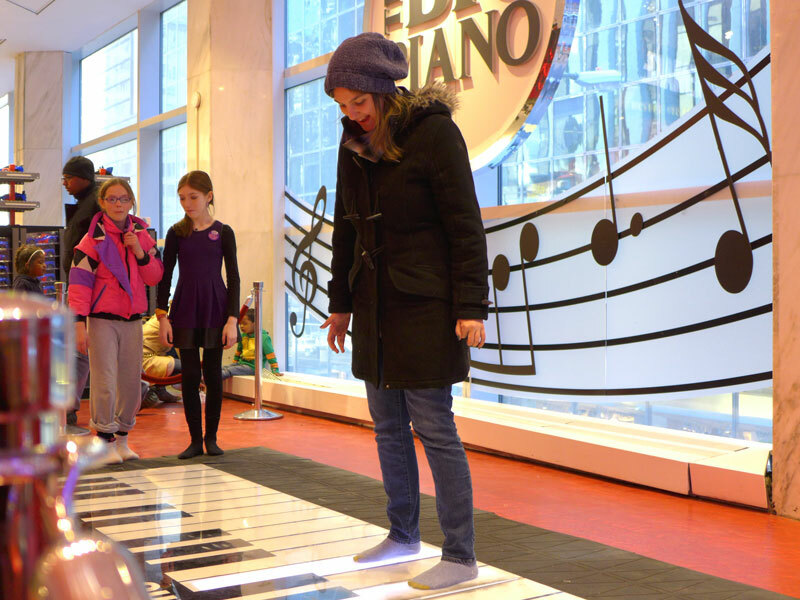 I headed there this weekend and charged past Playmobil parties, bubble demonstrations and huge stuffed animals with even huger prices (like a $1,500 stuffed giraffe – no joke) in search of the Big Piano. It’s tucked away in a corner on the first floor and, surprisingly, it wasn’t overrun with tourists and screaming kids – even on a Saturday afternoon. Ryan and I smiled for an overpriced picture ($24!) and then I waited my turn to tinkle the keys. Weellll, it turns out I’m not very good at the Big Piano. 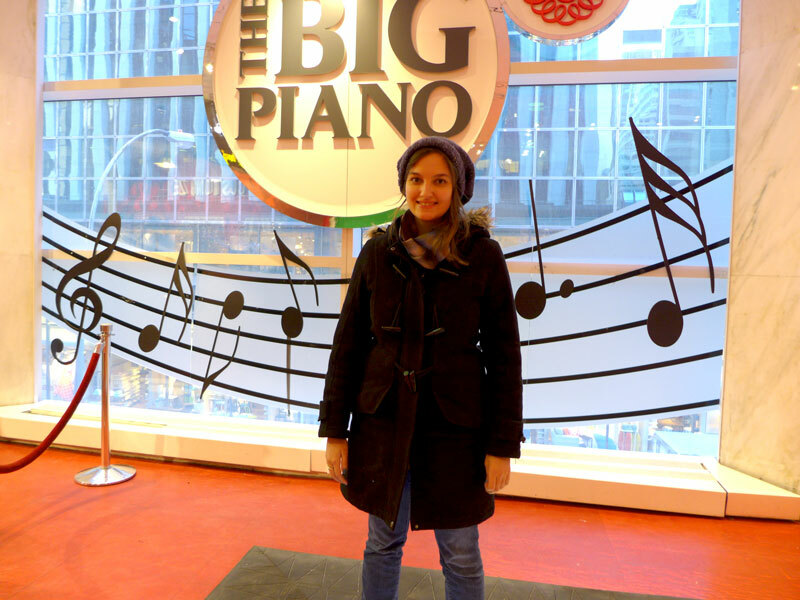 No matter how much I tried, I couldn’t play the tune from Big — partly because I couldn’t remember it, partly because my feet wouldn’t move fast enough, and partly because I couldn’t hear my notes over those played by the other kids (yes, I said other). Still, I don’t think being good at the Big Piano is really the point. I skipped up and down an arpeggio or two, but mostly clonked on the keys, rivaling the toddlers around me for grace. And while I’m sure there are some great dancers or musicians out there who could skillfully tap out a tune, I have no doubt that I had just as much fun. 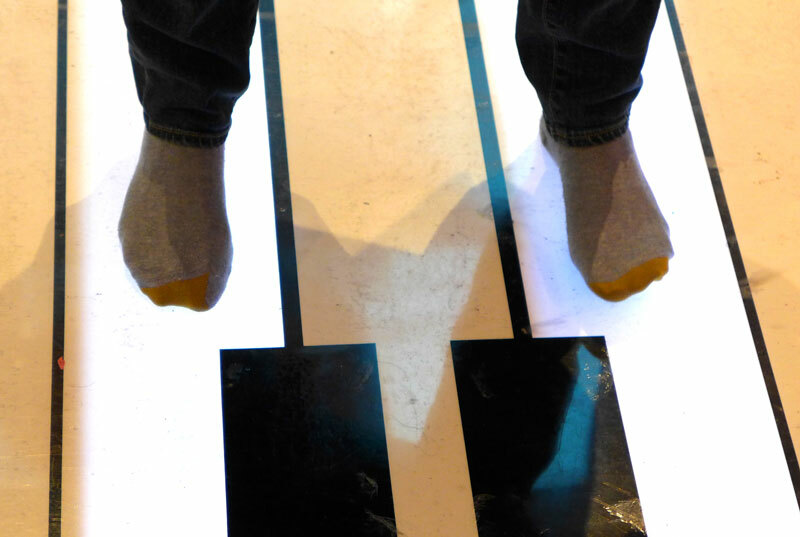 Oh, and another difference from the movie — no shoes allowed! 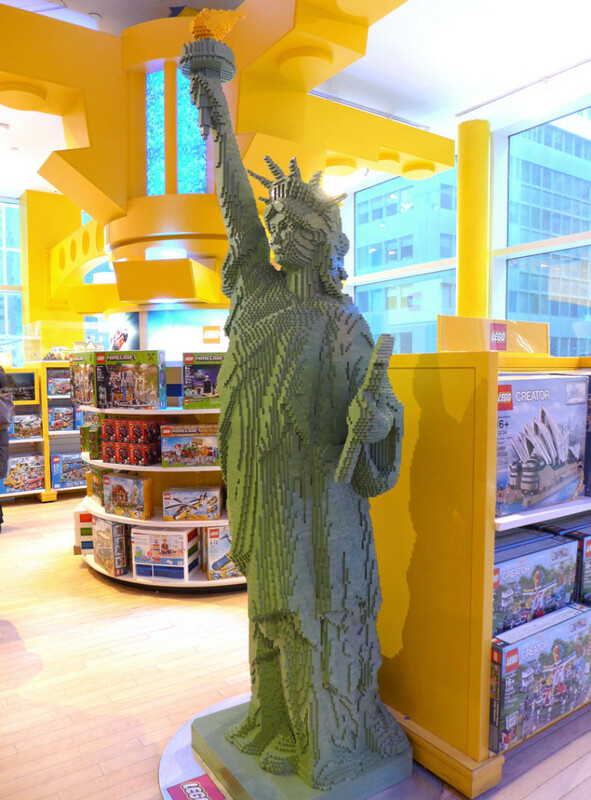 If you find yourself up at Central Park or the shops at Fifth Avenue (tourist territory) and want to take part in a quirky New York tradition, I’d recommend popping into FAO Schwarz. For me, the joy of the keyboard canceled out the store’s madness, and made the trip worth it. 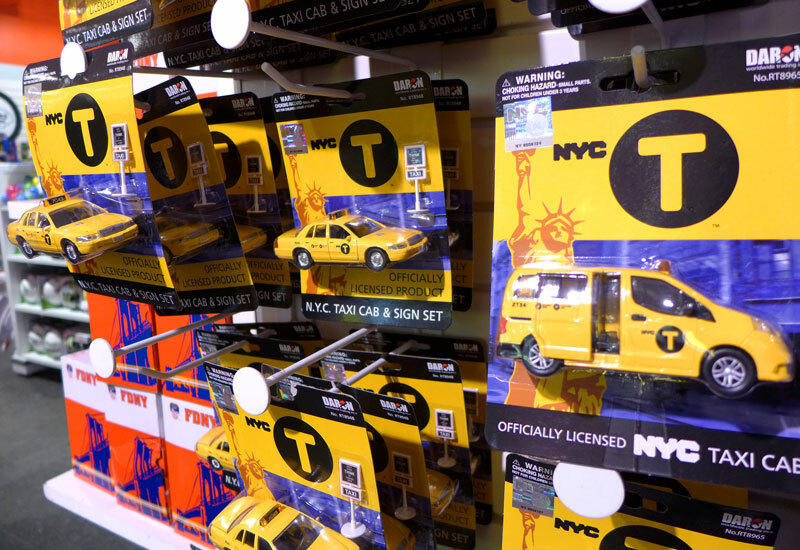 I spied some fun New York-themed goodies for gifts, but mostly I’d just advise you to zip past the toys and head straight for the tunes. Oh, and it means I’ve checked another thing off my ’30 Before 30′ list! 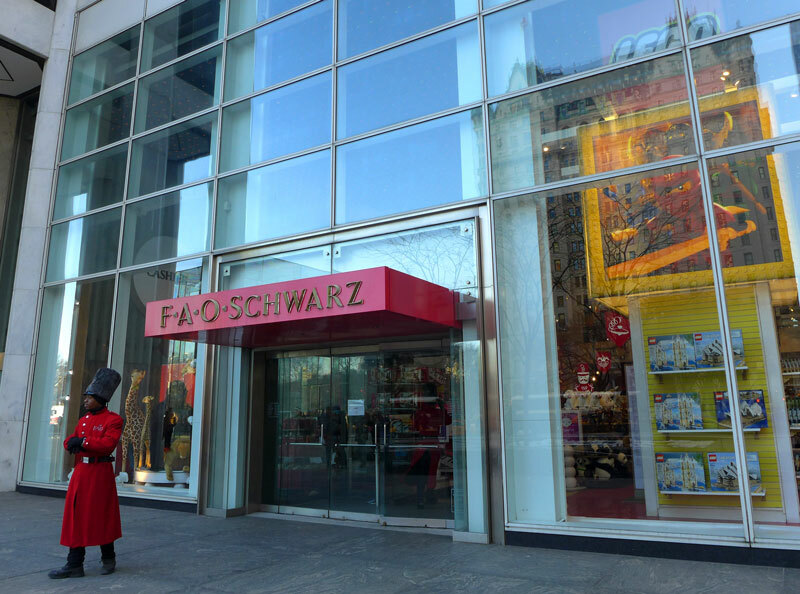 FAO Schwarz can be found next to the Apple Store on Fifth Avenue and 58th Street, on the southeast corner of Central Park. 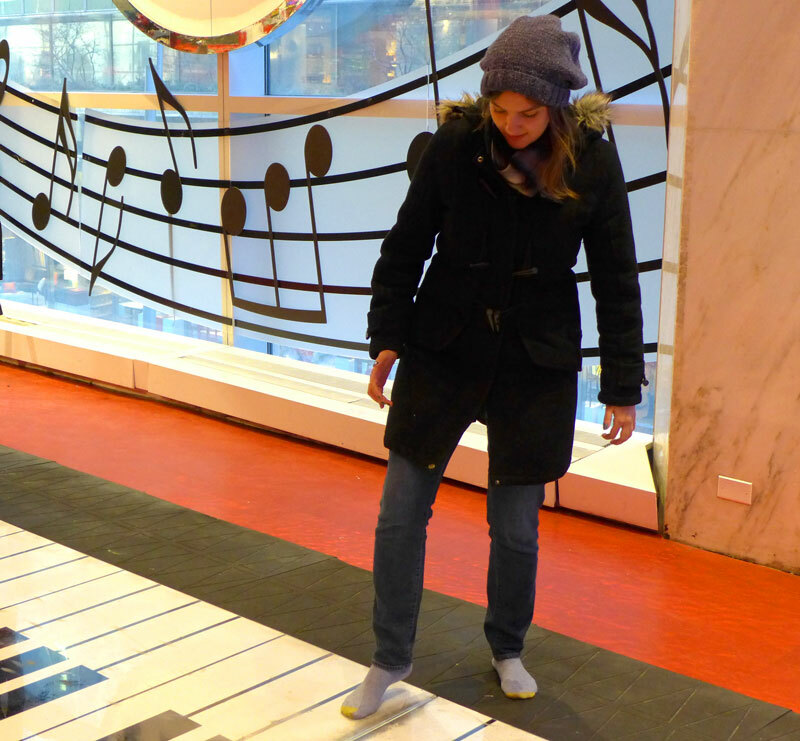 It’s free to dance on the piano, which can be found on the left-hand side of the first floor. The store is open 10am to 7pm Sunday to Thursday; 10am to 8pm Friday; 10am to 8pm Saturday. Looks like fun, where is the clip of your playing ? Oops, just seen the clip, very talented …. Hi Chanel! Yes, it was a fun little trip — definitely one for the NY bucketlist! 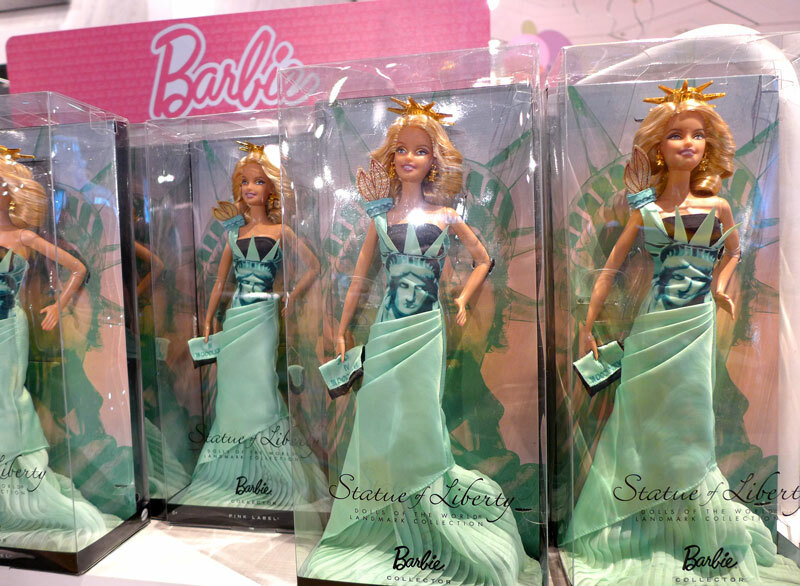 I think you did a really fabulous job, especially given the whole “no shoes” thing (well that’s just not fair, is it?!) And congrats for ticking off another item on your 30 by 30 list, yay!!! You know, Big was one of my favorite movies. However, I have never gone here or done this. To only time I can remember going to FAO is when I used it as the meeting point to locate this hot girl I was hanging out with. LOL. But I did not go in, and I did my best to get away from the area as soon as I found her. I guess as a life long New Yorker, the madness of tourists is not worth it to me. But maybe that’s why I’m a miserable old young man. Hahaha. I might have to put aside my hatred of tourist crowds, and do this one day. Haha, you didn’t take her dancing on the Big Piano for a date? Poor form 😉 It actually wasn’t as busy as I thought it’d be on a Saturday afternoon… but stick to weekdays to be safe! Yeah, I think the wisest idea while you’re there is to pick the section you want to visit and make a beeline for it! Otherwise you’ll probably be overrun by kids/tourists.